This volume looks at ‘Positional Play’ things like voluntarily giving up ‘The Bishop Pair’, How to attack doubled ‘C’ pawns, Placing Rooks deliberately on Closed files, The IQP advantages and disadvantages and many more Positional Play methods. 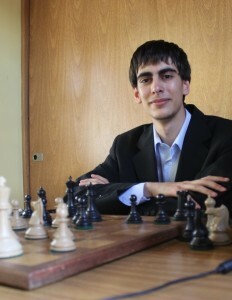 Many methods and concepts are considered including: Beating The QGD Tarrasch, QGD, Bogo Indian, QGA, Queen’s Indian considered, QGD Tarrasch examined in detail, IQP situation arising after dxc5 considered, Strong Centre versus attempts to undermine it, A collection of small Positional Advantages are no good if opponent can realistically launch a strong attack versus your own King, Passed IQP advantages and disadvantages, Good piece activity creates other transformational advantages, Temporary Piece Sacrifices to gain Positional Advantage, Using the Advanced IQP to tie down opponent, It’s Okay to advance your own King’s Pawn Cover when opponent is tied down, Good technique in the middlegame with more space and many more, in what is a brilliant approach to learning the core essentials for Club players up to Candidate Masters succinctly guided by Grandmaster Damian Lemos one of the World Leaders in Chess instruction. 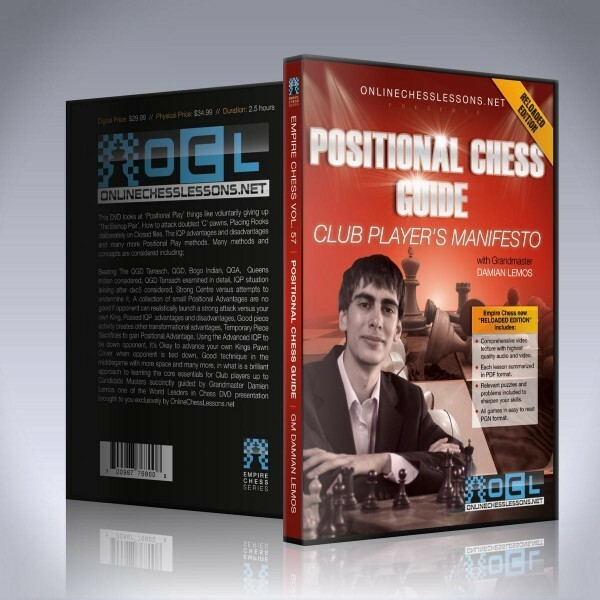 Grandmaster Damian Lemos’ excellent presentation skill guides you through this volume which is 7/10 of The Club Player’s Manifesto. Beating The QGD Tarrasch, QGD, Bogo Indian, QGA, Queen’s Indian considered, QGD Tarrasch examined in detail, IQP situation arising after dxc5 considered, Strong Centre versus attempts to undermine it, A collection of small Positional Advantages are no good if opponent can realistically launch a strong attack versus your own King, Passed IQP advantages and disadvantages, Good piece activity creates other transformational advantages, Temporary Piece Sacrifices to gain Positional Advantage, Using the Advanced IQP to tie down opponent, It’s Okay to advance your own King’s Pawn Cover when opponent is tied down, Good technique in the middlegame with more space and many more, in what is a brilliant approach to learning the core essentials for Club players up to Candidate Masters succinctly guided by Grandmaster Damian Lemos one of the World Leaders in Chess instruction. Exclusive Grandmaster/Master Video by a brilliant presenter. We preselect only the most compelling and interesting Grandmasters and Masters to make vidoes for us.